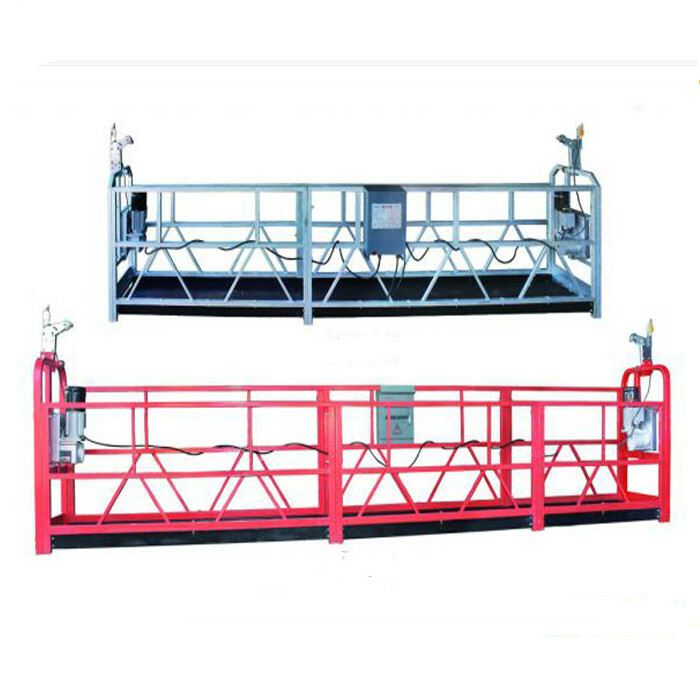 ZLP series Suspended Platform belongs to high-rise working construction machinery, mainly used to install curtain wall, facade cleaning or other works such as plaster pulp, veneer, paint coatings,oil paint,or cleaning and maintenance, etc., can also be used for large tanks, bridges, dams and other construction operations. 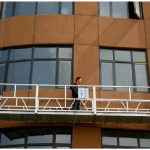 Applying this product can release scaffold free, reduce the costruction cost (cost 28% of tranditional scaffolding)and the efficiency will be greatly increased. Mean while, this products are with simple and flexible operation, easy transfer, convenient and practical, safe and relible. 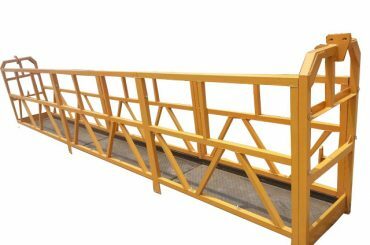 Platform length varies from 1 m, 1.5 m, 2 m, 2.5 m, to 3 m range. Customers can assemble them free as required. 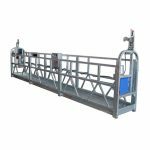 End frame: the first factory adopts raglan welding treatment. Secure, greatly enhancing the strength and safety of the platform. 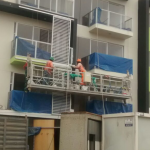 Each end of the platform install one hoist. The outer housing of hoist is die casting aluminum(104# Gb) material, not easy to crack. Rope pressure sheave is made of spring steel; turbine is made of 94# tin bronze. All above materials except turbines, are with heat and black oxide treatment. 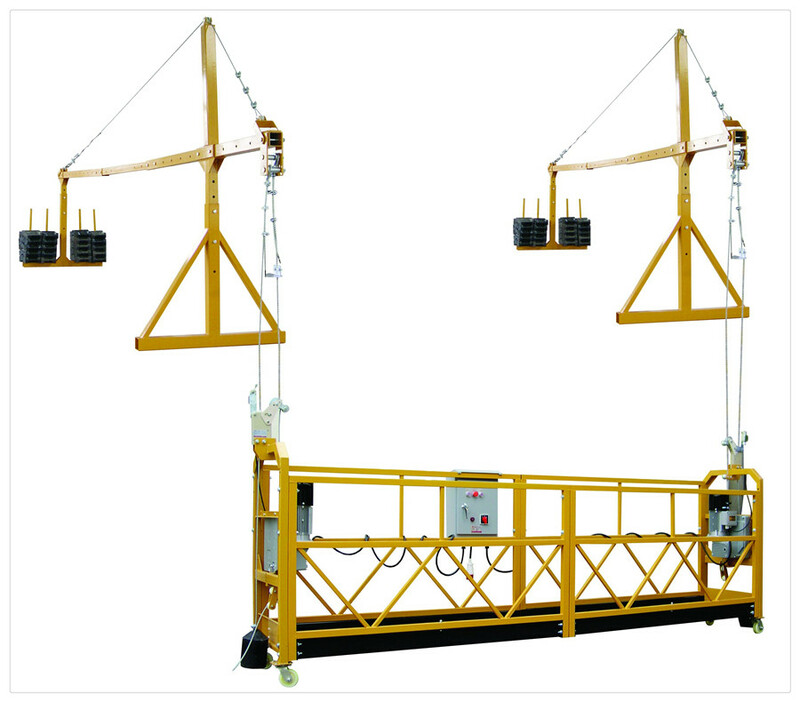 LTD series new type repairable hoist is a latest product researched and developed by our company after kinds of test. 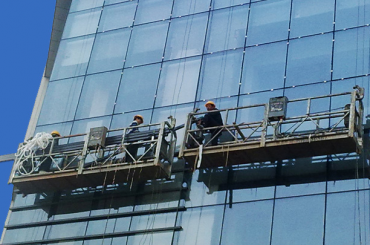 It was proved can be self repair from the wire rope’s force-deformation, bending, breaking and continue to use. This feature make it greatly increased the wire rope’s working life. 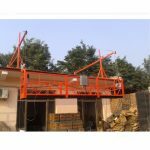 Safety lock and safety wire rope: Each end of platform install one safety lock and safety wire rope. 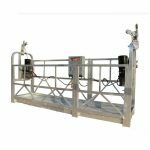 In case the work wire rope or platform tilted, the safe wire rope would be locked to stop platform moving. Safety rope (life line): 18mm diameter,is made from high strength filament,connect with worker. When the platform rapid decline due to a fault, the Safety Rope would tighted to prevent people falling. 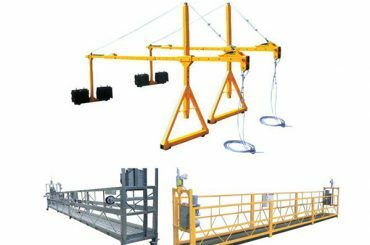 Hoist brake electromagnetic brake:keep the platformsuspended in the circuit failure or power outage. 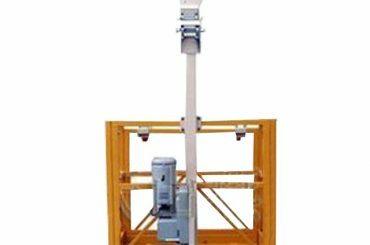 Centrifugal speed limiting device:ensurethe platform descendedspeed no higher than 1.5 times of the rated lifting speed, keeping the platform more stable. 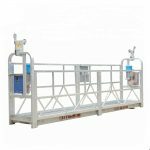 Manual hoist downhill device:in case of power failure or electrical failure, operate the manual to make platform decend, and keep workers’safe landing. Electrical emergency stop: press button, main power and control power off, stop platform moving. 1)auto stop and alarm when overweight. 4)safe and reliable with 1 year warranty. 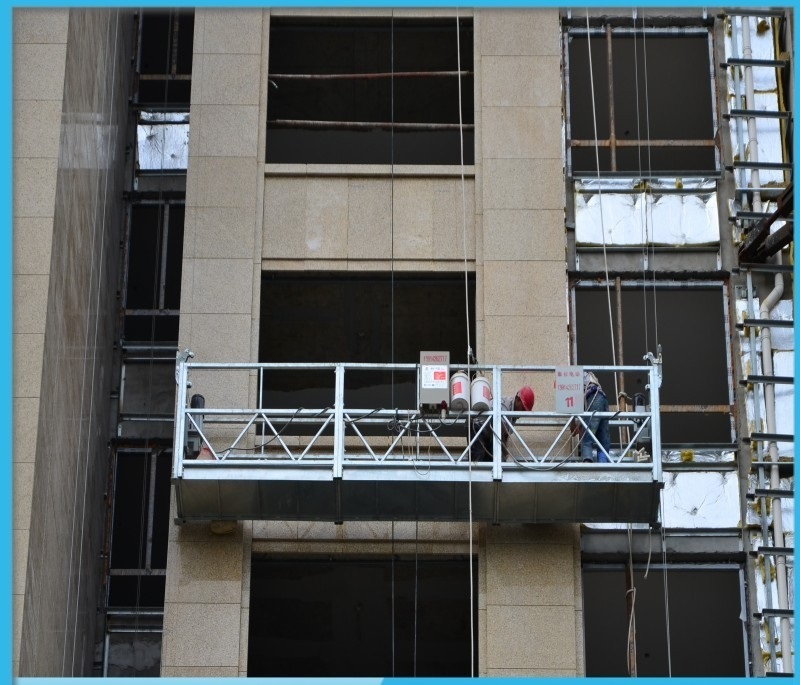 Erected on the building roof, composed of two independent steel frame and steel wire rope components. 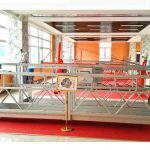 Each front beam of the steel frame hang two wire ropes, a work rope for hoist, a safety rope for safety lock. Wire rope: hot-galvanized, special use for suspended platform, high strength, good corrosion resistance, Fasten brand. 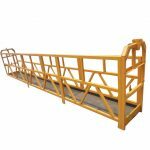 Front and rear beam specification 50 * 110mm, thickness: 3.75mm; Middle beam 60 * 120mm, thickness: 2.75mm. The rectangular steel is with higher tensile resistance than the square steel. Suspension Mechanism height: could reach as high as 1.98m. 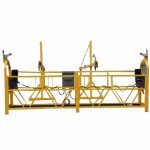 Adjustable total length of the front/middle/rear beam is from 5.2 to 7.6 m, suitable for varies kinds of complex floors. 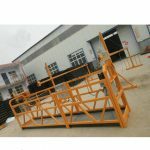 Suspension Mechanism parts adopts galvanized treatment, with higher corrosion resistance than the painting treatment.